Do you need to transfer money between Canada and other countries. You can use xe.com for the money transfer. New XE money transfer will be launching on Oct 31, 2016. To celebrate the launch, XE will be offering FEE FREE TRANSFERS TO ALL NEW AND EXISTING CLIENTS! 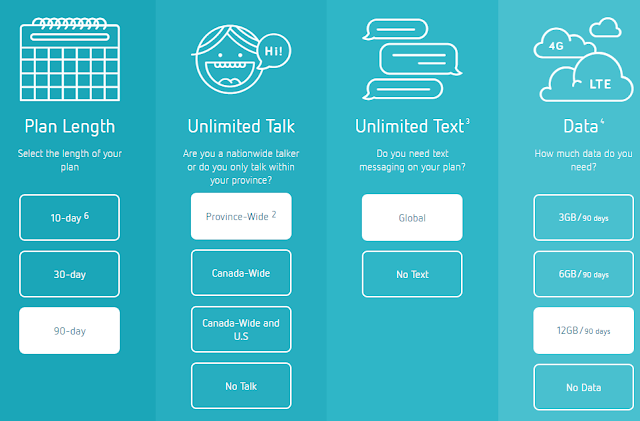 From October 25th to November 20th, Public Mobile will be offering an amazing promotion where you can get 12GB of data, unlimited province-wide talk and unlimited global text on a 90 day plan for only $120. This equates to 4GB each month for the low, low price of $40 every 30 days. If there was ever a time to get friends and family to join Public Mobile, now would be it! It only takes a minute or two and you’ll earn 1,000 bonus Aeroplan Miles simply for taking this short quiz. This is a nice and easy way to get you closer to status or boost your status in the Aeroplan program! BUT, this offer is only available to the original recipient of the email. Effective December 6, 2016, Aeroplan's flight reward fee structure for changes and refunds will be updated as per the above chart, replacing the previous flat fee of C$90 plus taxes per ticket. You can earn a 20% bonus when you convert your Marriott Rewards points into American Airlines AAdvantage miles October 15 - November 14, 2016. This exclusive offer is valid on regular point conversions as well as Marriott Rewards Travel Packages 【nice :)】. 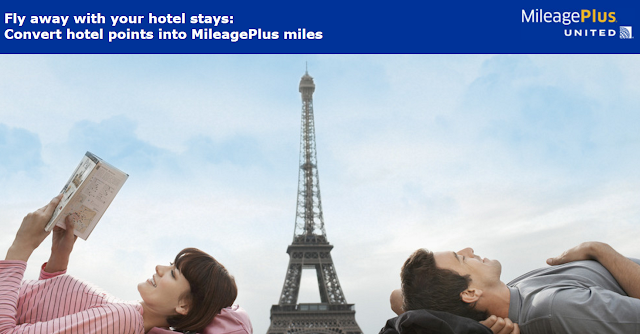 Now's the perfect time to exchange your unused hotel loyalty program points into United MileagePlus award miles. Convert your points now and enjoy a 25% bonus on your points-to-miles conversions – up to 20,000 bonus award miles. Hurry, this offer ends November 30, 2016. Online registration is required. You can get a bonus 90 PC points per dollar of your $25 or $50 gift card purchase for Golf Town, The Keg Steakhouse + Bar, Sears, Le Château, Bass Pro Shops, Spafinder Wellness 365™, The Ultimate Dining Card, or La Vie en Rose in addition to the regular 10 PC points per dollar earned for all purchases on the PC Financial World Elite MasterCard. This is equal to 10% return. MBNA SmartCard: from MasterCard to Visa? If you have a MBNA Smart Cash Word MasterCard, when you log-in your account, you may found that your card is converted to Visa Infinite with a new card number. Based on the online news, this is confirmed by MBNA. 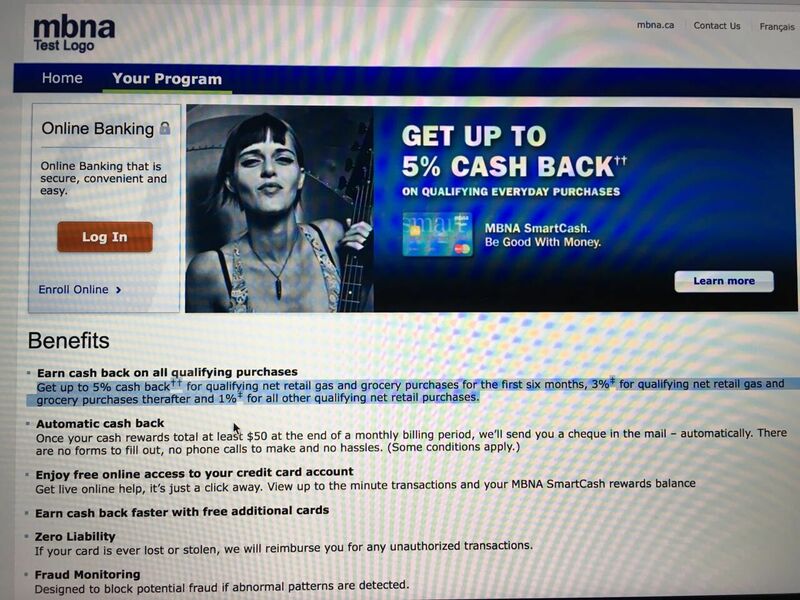 MBNA has converted the Smartcash account from a Mastercard product to a Visa product. The Smartcash rewards program will remain unchanged. People will be receiving a replacement card over the next few weeks and detailed information about the benefits associated with the Smartcash Visa. Someone found that MBNA may also change the gas/grocery purchase cash back percentage (after 6 months) from 2% to 3%. We still don't know if this is a typo or true. Let's wait and see. You can get $25 off $200+ when you pay with Masterpass at newegg.ca. You need to enter promo code MPGAMERCA7 at checkout and then pay with Masterpass for an order of $200 or more before taxes or shipping. Note: Does not include Pre-Order or Gift Cards. Discounted Esso gift cards are back on eBay. Now, you can get $100 Esso Gift Card for $95 with free shipping. Purchase limit (5) per eBay User ID. I just bought 5 for myself. Until Dec 31, 2016, you can get $100 when you open an account and an extra $100 for every new member you refer. Each referred member will also get $100. Get an Odyssey World Elite MasterCard and take advantage of our welcome offer worth $300 credited as BONUSDOLLARS. 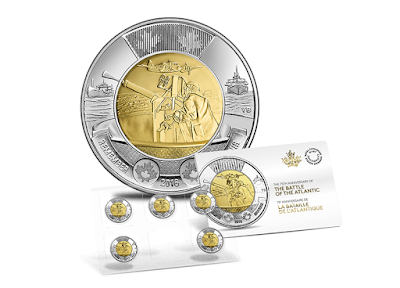 - This promotional offer is only available at the Toronto Branch of Desjardins Voyageurs Credit Union at 11 King Street West. The payment of 300 BONUSDOLLARS is a promotional offer that runs from September 12 to November 27, 2016. AmEx is introducing the American Express Installment program. The Installment program gives you more control over your American Express Card purchases by providing the convenience of paying for large purchases in equal monthly installments. Plus, you can choose the term that works best for you. Between October 7–24, 2016, new and existing eligible postpaid customers qualify for 1GB of free bonus data (500MB a month for 2 months). Your bonus data will go into effect when your November billing cycle begins. Swagbucks.com is an online rewards destination by Prodege LLC. It enables users to earn points (called SB) by performing a variety of online activities, including searching, shopping, taking surveys, playing games, and discovering online content, and then to redeem those points for retail gift cards, PayPal cash, or other rewards. Although it is a US company, Canadian residents can also earn rewards from it and redeem for Amazon.ca gift card, Paypal.ca cash etc. Get your surprise points card when you spend $75 or more on almost anything in-store at Shoppers Drug Mart. Offer valid from Saturday, October 8, 2016 to Sunday, October 9, 2016. 5% cash back on all purchases in the first 6 months up to a maximum of $400 cash back. In Sept 2016, I applied this card through a referral link. Once I received the card, I was surprised by the manual, which shows the $79 annual fee is waived for the 1st year (FYF). I am pretty sure that I did not see anything about FYF during my application. I told this to a few friends of mine. One of them tested it and yesterday he told me that he received the FYF too with this card. As you know, if you apply the AmEx SimplyCash Card through a referral link, you will get an extra $50 bonus from AmEx. So, we assume this FYF of preferred version card may come with the referral link as well. If you are interested, you can try it yourself and tell us the results (YMMV). From my point of view, the $400 cash back alone is worth it, even you don't get the FYF. BTW, if you need a referral link to apply AmEx SimplyCash Preferred Card, please don't hesitate to contact us: canadianrewards@gmail.com Thanks. 【updated on 10/21/2016】AmEx did charged the $79 annual on the 1st statement. Called AmEx, and they admitted this is their internal mistake. AmEx asked for the copy of the manual (faxed). Let's wait and see what happens. 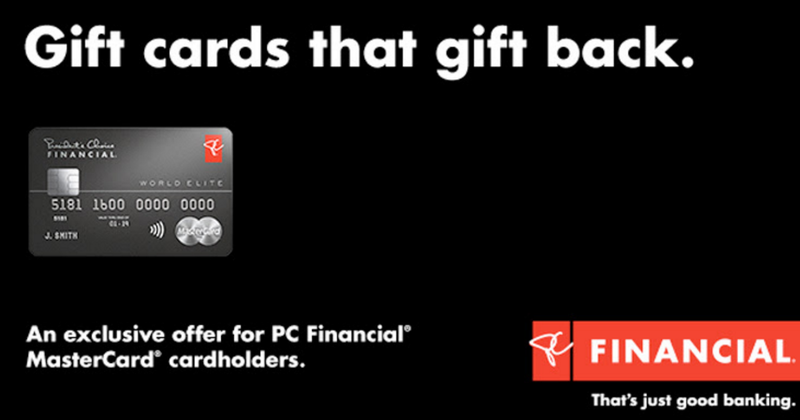 Now you can earn 2X points on all of your purchases at Fairmont when you use your RBC Rewards credit card. From playing 18-holes on the golf course to spending a day at the spa, simply charge your purchases to your room and you'll earn 2X points! Plus, as an added bonus, you’ll earn an extra 1,000 bonus points when you book your first stay. The previous Tangerine interest promotion ends on Sep 30. Now, Tangerine is offereing a new promotion (targeted). 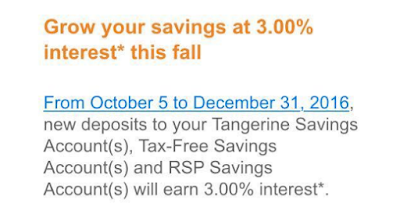 You can earn 3% interest in new deposits to your Tangerine Savings Account(s) , Tangerine TFSA and RSP Savings Accounts from Oct 5 to Dec 31, 2016. Note: This offer is targeted. Different people may get different rates. To receive the Offer, Tangerine Clients must have received the Offer by email directly from the Bank, and/or received a notification that they are eligible to participate in the Offer when they log in on the Bank’s website. Clients must also be the Primary Account Holder on the Applicable Account. All eligible RBC Royal Bank cardholders and other clients that earn RBC Rewards points have the option of converting their points into WestJet dollars. You must be a member of WestJet Rewards in order to convert your RBC Rewards points. If you convert your RBC Rewards points between October 3, 2016 and November 14, 2016, you can receive 15% more WestJet dollars! Now you can shop at Amazon.ca and pay for purchases with your AmEx MR points at check out. 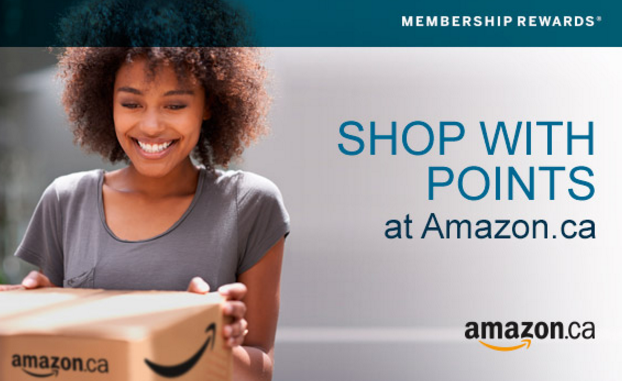 The redemption rate is the same as the "Use Points for Purchase" program of 1,000 MR points = $7. From my point of view, I strongly suggest you NOT to use this option, as the rate is too low.